True Grit is a powerful story of vengeance and valour set in an unforgiving and unpredictable frontier where justice is simple and mercy is rare. 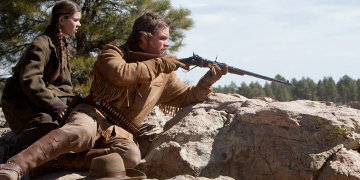 Mattie Ross (Hailee Steinfeld), is determined to avenge her father’s blood by capturing Tom Chaney (Josh Brolin), the man who shot and killed him for two pieces of gold. Just fourteen, she enlists the help of Rooster Cogburn (Academy Award® Winner Jeff Bridges), a one-eyed, trigger-happy U.S. Marshall with an affinity for drinking and hardened Texas Ranger LaBoeuf (Academy Award® Winner Matt Damon) to track the fleeing Chaney. Despite their differences, their ruthless determination leads them on a perilous adventure that can only have one outcome: retribution. As good as the original? Was going to be tough for this film to beat the original, but was a very good effort. True Grit is closer the the story in the book than the earlier John Wayne classic. It is the third film of this classic cowboy story about a young girl trying to engage a old and 'ornery' old bounty hunter, in order to avenge the death of her father. 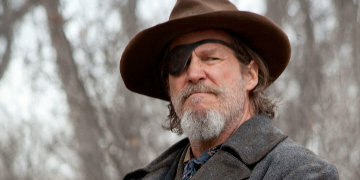 Jeff Bridges is brilliant if difficult to understand. Overall, it's an outstanding film. One of the best westerns I have ever seen. A must-buy for any collector. A brilliant story of a girls fight to get justice for her fathers murder. When the murderer leaves town she hires two men to track him and bring him back to face trial and possible hanging. A true tale of how determination and grit can make anything possible. I went to see this movie at the cinema and would certainly choose to watch it again. A story an amazingly tough young girl and her quest to seek revenge on her fathers murderer with the help of drunkard bounty hunter Rooster Cogburn ( played excellently by Jeff bridges, surely a match for the original Rosster played by John wayne). Hindered and eventually helped by Matt Damons character. All the actors were brilliant and it was a worthy remake. Watch it now!